Jamali Garden: How did you get into floral design? 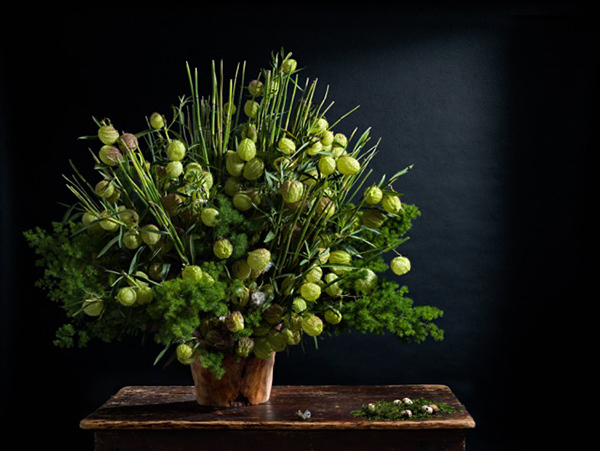 Peter M. Krask: I got started as a floral designer purely by accident! When I first moved to New York over twenty years ago, I had a temporary job doing administrative work for a floral design company. One day the owner couldn’t find any freelance designers to come in and work, so, facing a long list of orders to get out, she put me to work making the arrangements and left me alone to get the job done. The rest is history. JG: What does PMK Floral Arts specialize in? PMK: PMK Floral Arts is a boutique floral and event design company specializing in custom and collaboratively designed events from weddings, corporate events, to celebrations of all kinds, and weekly installations for private residences, corporate and hospitality clients. My work is informed by my interest in, and study of, fine art, photography, architecture, music, and theater, areas in which I have either worked or studied. I continue to be surprised and delighted how these disciplines inspire my approach to design in unexpected ways, and how they enlarge my ability to determine what will work for an event and help a client communicate who they are. Arrangements at Eva Scrivo Salon. 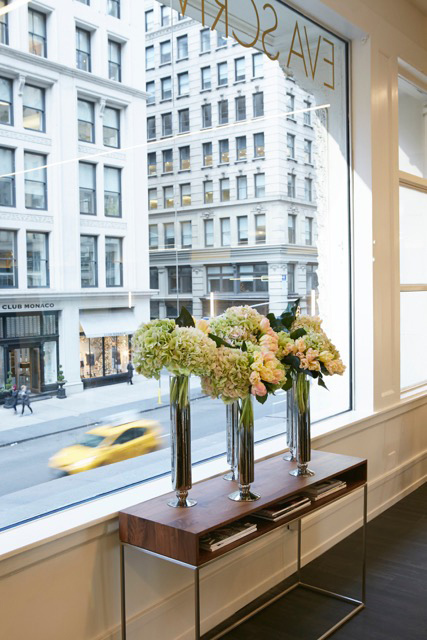 PMK: These arrangements were created for the recent opening of my dear friend, and acclaimed hair and make-up artist and beauty authority, Eva Scrivo’s newest salon on Fifth Avenue in the Flatiron District. These arrangements include pistachio jumbo antique South American hydrangea, Dutch salmon parrot tulips, and anthurium arrow leaves in my current favorite Jamali Garden vase, your Nickel & Chrome Tube Vase. Eva’s space is so chic and elegant, and these understated arrangements brought a subtle hint of color to tie it all together. PMK: All following images and arrangements were the result of a collaboration for a photographic exhibition “life . . . still” which I created with my photography mentor and close friend, Carol Dragon. I designed the arrangements and Carol photographed them. Our goal was to honor the fine art tradition of the still life but in a truly contemporary and thoughtful way. Tweedia, hydrangea, & amaryllis arrangements in mercury glass. JG: We love these for a spring or Easter celebration. 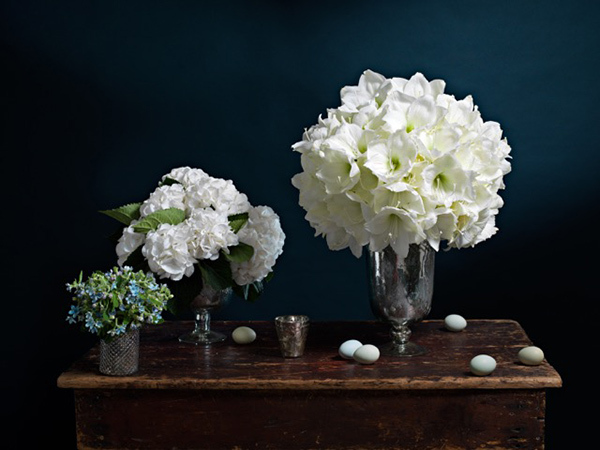 PMK: The hobnail vase is filled with my favorite blue tweedia; the compote holds Dutch snowball hydrangea, and the Leaf Etched Vintage Mercury Glass Urn is filled with Montblanc amaryllis. I used about 25 stems of amaryllis for this to get the full shape of a ball here. Horsetails, pope’s balls, & Japanese mountain fern. PMK: For this one, I was actually inspired by your fir wood bowl. The simplicity of its shape, the organic and unfinished feel of the wood suggested some kind of green wildness growing out of a fallen tree trunk, like one would see in the forest. JG: We love the monochromatic look of your arrangements. Is that a design style you favor? PMK: When creating arrangements that are going to be photographed, I’ve learned, by trial and error on television, that a monochromatic look can often be a more effective approach; it reads better and is captured better. Subtle variations in color can heighten this approach too. Try using the same flower – but in two quite similar shades, almost indistinguishable – side by side; you’ll be surprised how much this can look like light and shadow and how that will read in a photograph. A controlled approach to color can contribute to an arrangement’s sense of being a sculpture; it directs the eye to a shape first. That’s the impact. 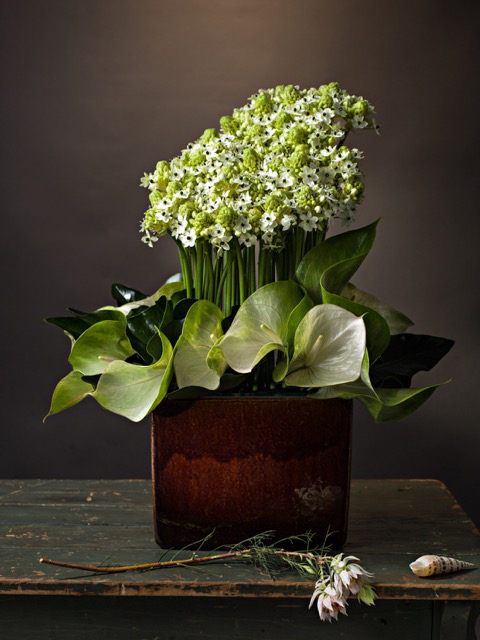 A simple combination of elements: arabacum, Grace anthurium, and anthurium arrow leaves. JG: But, we also adore your mixed arrangements. They have an old-master’s painting feel to them that we love. Is that how you would characterize them? PMK: My design sensibility is expressed most clearly in my approach to color and how I work with it. 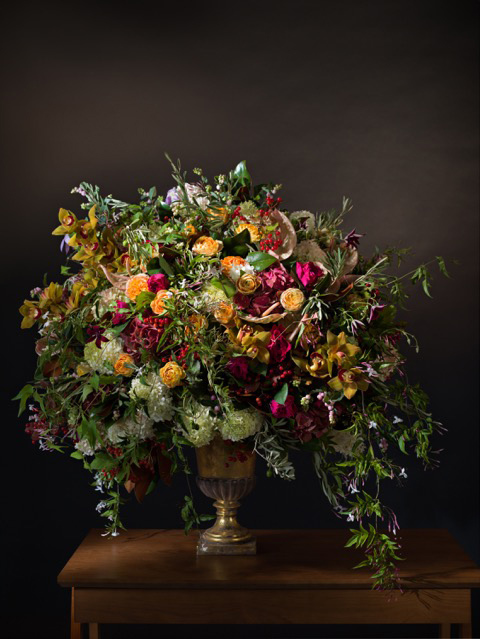 These arrangements are inspired by what we think of as classic Dutch Old Master still life paintings; it’s the point of reference for how we all collectively think of flower arrangements. Every florist I know is trying in some way to work with that idea and rise to the challenge. I hope I am working in that lineage and enlivening it with a playful sense of color and an unexpected mix of flowers. This Lion Handle Urn includes: Dutch hydrangea, garden roses, anthurium, vanda orchids, persimmons, grapes, and jasmine vine. This gold urn arrangement includes: PeeGee hydrangea, Dutch hydrangea, garden roses, anthurium, cymbidium orchids, viburnum berries, olive branches, clematis vine, and jasmine vine. Hydrangeas, roses, anthurium, cymbidium orchids, viburnum berries, olive branches, clematis vine, & jasmine vine. JG: Any good tips or basic advice for keeping and handling flowers at home? PMK: My main advice for making arrangements at home is to use more flowers! I think people always underestimate how many flowers they need, usually by half to my taste. Skip the filler and go for more flowers; it will transform the way an arrangement looks. People who watch me and my team at work are always surprised by just how many flowers I use in an individual arrangement but I think it’s one of the keys to success. And, don’t forget: always strip your stems of any foliage that will be below the water line of your vase. JG: Succulents are having a moment, and we love how you accented this arrangement with them. 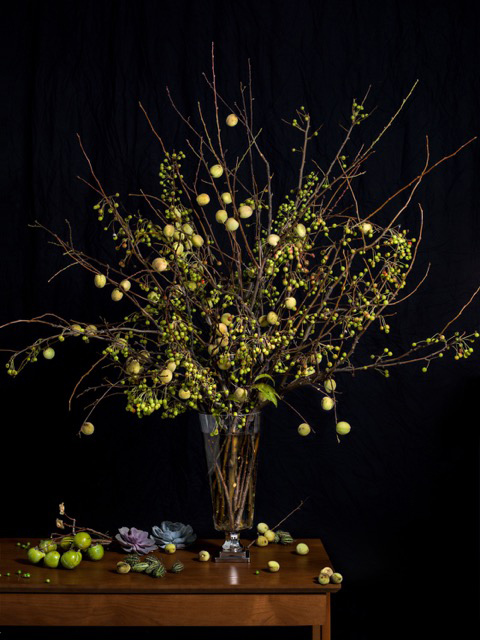 PMK: This branch arrangement in your Platinum Pedestal Vase, is made of quite simple elements: late-summer peach branches with fruit, and pear branches, but both carefully trimmed and manicured to look wild and natural. You’d be surprised by how much one has to prune to get something to look natural. It’s styled with large echeveria succulents. Succulents are popular because they are so striking. JG: How long will the succulents last? PMK: Unplanted and without roots, I have found that they can last about 5-8 weeks depending upon the amount of sunlight they receive and how dry the air is. Dramatic changes in light will shorten their longevity, but steady sun and the occasional dusting and run under a faucet with cool water should ensure an extended opportunity to enjoy them. 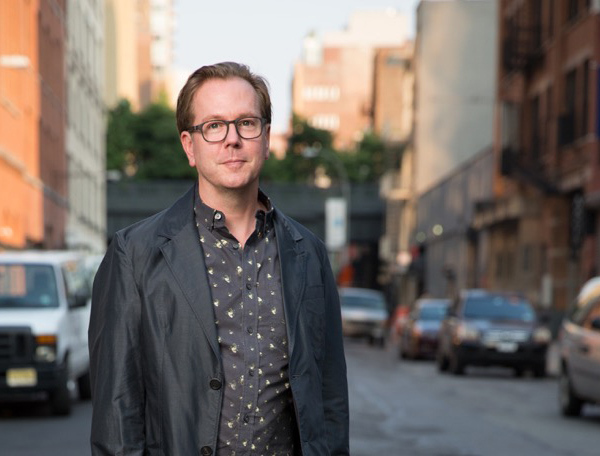 Read Peter’s personal biography here. 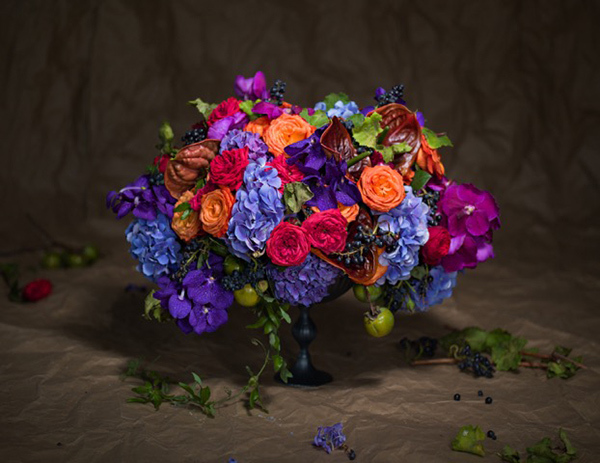 Absolutely stunning arrangements in these photos. It’s great to read about such a talented designer like this. Thanks for sharing!